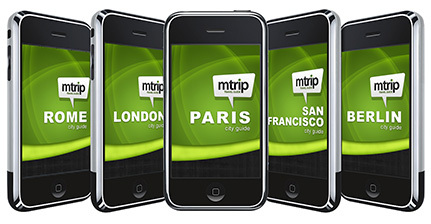 mTrip has made updates to the travel guide. Check out the changes and don’t forget to go to the App Store to get your update! All updates from mTrip are free. The high-resolution retina display is available on the iPhone 4 and the new iPod Touch. You will notice that everything looks sharper and more vibrant! Here is a comparison of the regular resolution and the new high resolution. Wow, big difference! Now the map is clearer than ever. 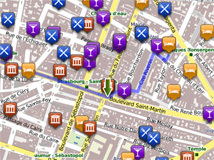 The enhanced display shows every detail on the map in a clear and crisp view. 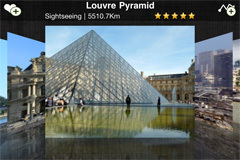 When you are checking out attractions in the travel guide, you can now get a more visual display of them. Simply flip your phone sideways and flip through to see all the cover art. Each picture will display its name, rating, the ability to add as a favorite as well as the ability to access each point of interest directly from the picture. When you view your map, you will notice that the top ten attractions and your favorites are visible. This is to help you get your bearings and to better understand where you are in relation to important points of interest. 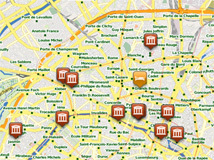 Zoom in to see the places displayed as icons in orange. 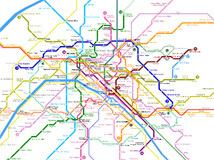 Although you may get around with ease just with the mTrip map and directions, you may also find it useful to have a map of the cities Subway. 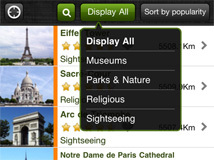 Travelers have been requesting this so we decided to integrate it into the ‘More’ section of the App. We hope you find it useful! 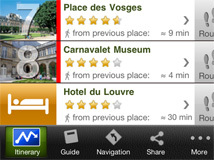 We’ve made the sub-categories in the travel guide much easier to navigate. Whereas before they were listed in a slide menu at the top, they are now in an easy to navigate drop-down menu. You can further drill down your sub-categories by using the other drop-down menu. The menu includes: points of interest by neighborhood, in alphabetical order, by popularity, price (for hotels and restaurants) and distance. mTrip’s developers have enriched the mTrip Genius, making your trip itineraries more useful and a little less full so you have plenty of time in your day to see everything you set out to do. 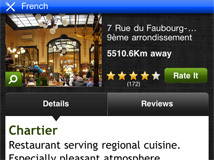 When you add a favorite, it will display with a heart in your list of points of interest within the travel guide. This way you will already know what you have added to your favorites list. Your hotel accommodation will also be listed on each day of your trip itinerary so you can easily get directions back to your hotel when you are finished your day of sightseeing. mTrip’s product development team has been hard at work to enrich each city guide with new attractions, hotels, restaurants, bars/entertainment and shopping destinations. Enjoy! If you have any questions about the new updates please leave a comment! Don’t forget, the update is free!